On April 15, 2013, two pressure-cooker bombs went off near the Boston Marathon finish line, killing three people and leaving 264 injured. The day's tragedies echoed through Boston and the rest of the country Tuesday, as thousands of people gathered on the one-year anniversary of the bombings for quiet memorial services and ceremonies. In Boston, 2,500 people came together at Hynes Convention Center for a somber ceremony, which included remarks from Vice President Joe Biden, Boston Mayor Martin Walsh, and Massachusetts Gov. Deval Patrick, among others. During the ceremony, former Mayor Thomas Menino said, "You are strong at this broken place. That strength thrives even in the heartaches of today because of the compassion that took over this city." Menino told survivors and families of victims that Boston and its people will stand by them to help them recover and move on, adding that "the heartbeat of Boston is a mighty force." Biden addressed the survivors by saying, 'My God, you have survived, and you have soared." Biden added that the survivors have shown the kind of courage that will inspire any American dealing with a tragedy or loss. Four survivors spoke before him, and he complimented each by saying: "You are truly, truly inspiring. I have never heard anything so beautiful as what you just said. ... We are Boston. We are America. We respond. We endure. We overcome. And we own the finish line." 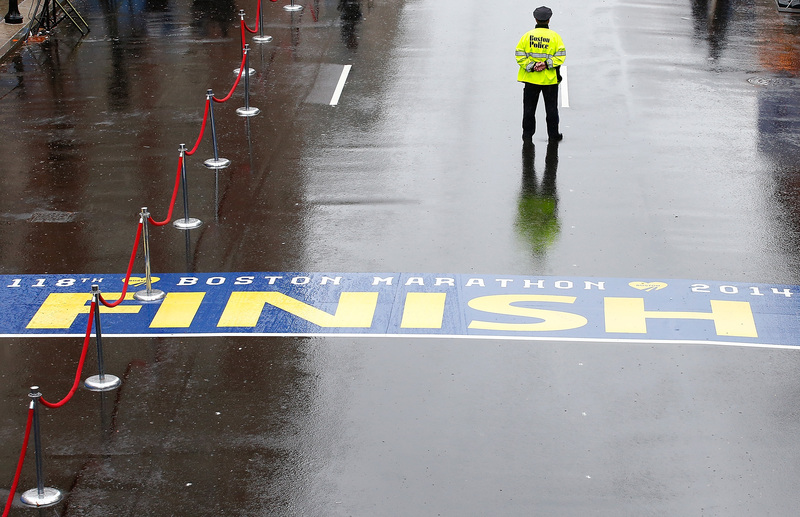 Tom Grilk, Boston Athletic Association executive director, says marathon runners will race again next week. But for now, Grilk says, they gather to remember the tragedy that unfolded in Boston just one year ago. The victims' families are still having a tough time one year later, and understandably so. Lillian Campbell, the grandmother of Krystle Campbell, 29, says Krystle had that "special thing about her. You felt happy around her because she was always laughing and bubbly. I loved her." Numerous survivors also took the stage, including dancer Adrianne Haslet-Davis, who lost her left foot last year. In addition to the speakers, the Boston Pops Orchestra and the Boston Children's Chorus performed at the ceremony. The Boston Marathon will take place next week, and some victims injured last year are planning to participate in the marathon again this year. Kevin White, 34, is one of them. Shrapnel went through his legs last year and his 71-year-old father, Bill, lost a leg. "Last year, I was on the ground at the finish line," White said during the ceremony. "This year, I'll be running across it. It kind of proves to people that evil isn't going to win." Personally, I can't think of anything much more courageous than that. There is a high level of security for the marathon this year, and the race is expected to bring in $176 million for the local economy.